down. 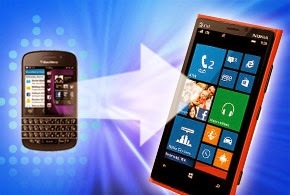 Nothing highlights this more than a new how-to video appearing on Nokia's official UK blog that demonstrates how to move your information from a BlackBerry device to a Nokia Lumia mobile handset running Windows Phone 8. The video demonstrates the process of moving data from older BlackBerry handsets as well as newer models running BlackBerry 10 and it shows how to get the BlackBerry software necessary to carry out the transfer. Throughout the video, the demonstrator talks about how Nokia's style is superior to BlackBerry's and he encourages viewers to buy a Lumia phone and to move away to something new. Of course, Nokia is hardly the only smartphone maker going after BlackBerry. Samsung has been the most active player in encouraging enterprises to dump BlackBerry phones and switch to its Knox 2.0 improved security container system. Samsung was also a major player in rumors that the White House was contemplating a switch from BlackBerry to Android. While the Samsung rumors about a White House switch were vastly overstated, the fact remains that the company is doing whatever it can to gain converts. These efforts are clearly beginning to sting. How much do they sting? Enough that BlackBerry's president of Global Enterprise Services, John Sims, wrote a blog that specifically called out Samsung and its many security struggles, saying that a move to the company's devices would be risky. The fact is, despite BlackBerry's leadership in providing secure enterprise communications, its competitors will continue to kick the company when it's down. Why is this? After all, doesn't BlackBerry have a vanishingly small percentage of new smartphone sales? The reason, of course, is that while sales might be small, the installed base of enterprise smartphones remains quite high, higher in fact that Samsung's. A recent Gartner survey placed BlackBerry's installed base in the enterprise at about 26 percent, which is higher than any other company except Apple. While Android take overall is higher than either, Samsung's portion of that is still fairly small by comparison. Nokia, meanwhile, must be salivating. The share of Windows phones in the enterprise is tiny both in sales and installed base. Despite those paid product placements you see on television, Windows phones show up only rarely in enterprise settings. Getting some of the BlackBerry installed base to move to Nokia would be sweet indeed. While Nokia may be able to get BlackBerry consumer users to switch based on a nice camera or a sleek design, it's unlikely that these attributes will sway enterprise or government users. Partly that's because Windows Phone does not have a security capability anything like BlackBerry phones. In fact, it doesn't even match Samsung's troubled Knox security. Especially in today's security atmosphere where new cyber-attacks are a daily event and where even long-trusted security systems are found wanting, reliable security is more precious than ever. While Microsoft's version of SSL [Secure Sockets Layer] wasn't involved in the Heartbleed bug, the fact is that Microsoft's encryption and security haven't been as relentlessly assaulted as has BlackBerry, where state-sponsored hackers and intelligence services have tried to crack its encryption and failed. Remember the screams from the governments of India, Oman and other states promising to ban BlackBerry? This is why. But even if Knox security wasn't having problems, it still lacks an end-to-end management system that comes with BlackBerry Enterprise Services 10. Worse, while BES 10 can manage BlackBerry devices, along with Android and iOS devices (and eventually Windows Phone devices), Knox can do none of these—it's brand specific to Samsung—and only to some of that company's devices. So where does this leave BlackBerry? As nice as its security profile may seem, it's not exactly in the catbird seat. In fact, it's closer to being in the hot seat. Just because a variety of vendors taking aim at BlackBerry now haven't hit the mark doesn't mean they won't eventually. There will come a time when some company, somewhere, will field a management and encryption system that's the equal of BlackBerry. In fact, the only thing that would even slow down the launch of a BES equivalent would be if BlackBerry, flailing for help as the company sinks beneath the accumulated weight of its own failures, sells off BES and the BlackBerry global network to a stronger player. Who might that stronger player be? Obviously, it's impossible to say given the many variables in this business. But if I were to pick, the logical answer is Microsoft. The Redmond, Wash., giant has been working to become an all-encompassing enterprise mobile system for years and it's about to take over ownership of Nokia. Yes, the same Nokia that's urging people to drop BlackBerry in favor of its much sexier phones. In fact, Microsoft may be the only company that really could absorb BES in a credible way. But that's by no means a foregone conclusion. Right now BlackBerry is suffering the unkind cuts of its fellow device makers, and those cuts alone may take enough of a toll on BlackBerry that it could slip quietly away, leaving nothing, not even its network, behind.